If you’re travelling on a budget and looking for solid backpacker-style accommodation, look no further than Kuantan Backpackers. Ad Book now! Rates from US$6++. Average rating 7.5 from 91 reviews. 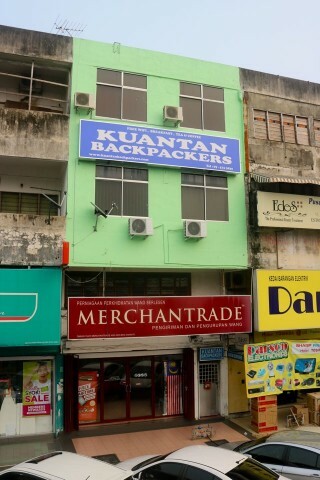 Located on the first floor above a row of shopfronts, (the mint-green coloured) Kuantan Backpackers offers female-only and mixed dorms with enough space to move around in. There are also lockers (bring your own padlock) that are large enough for valuables and a daypack. A shared kitchen area offers full cooking facilities and there’s also a small common area. All bathrooms are shared. Kuantan Backpackers is a five- to 10-minute walk to the river and five minutes to the Rapid Kuantan Hentian Bandar bus station. Free WiFi throughout and free breakfast is also included. Check rates at Kuantan Backpackers on Booking.com.